This award recognizes innovative projects that seek to solve a water shortage at home, at work (or school), or on the farm. Financial support comes from the Watershed Institute at California State University Monterey Bay and Stanford University’s Hopkins Marine Station. The award comes with a cash prize and recycled glass trophy designed by Winners of Monterey. 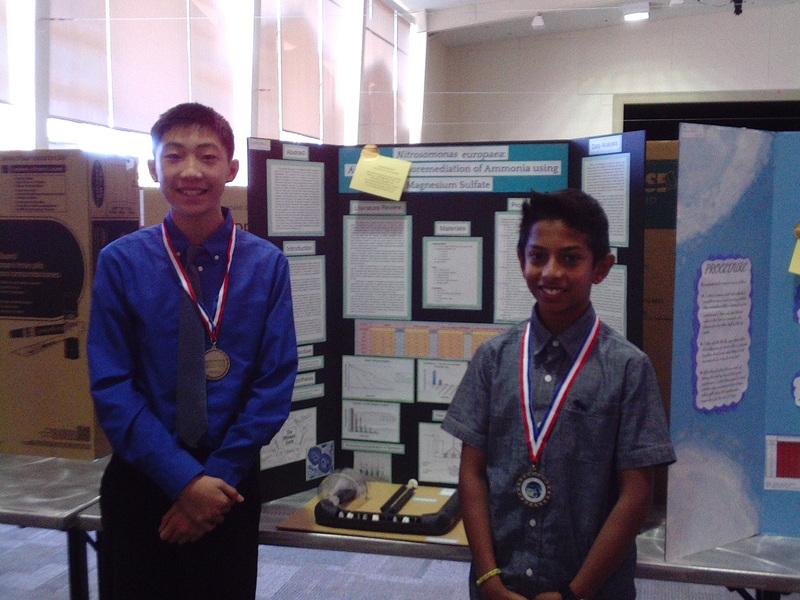 Students from the International School of Monterey Win Water Award for Projects on Greywater Recycling and Aquaponics! Rio appreciates the value of greywater recycling. After learning that daily toilet flushing uses up to 40% of a household’s water budget, she decided to focus her project on ways to reduce that impact with greywater. She reasoned that if toilets could be flushed with greywater, not potable drinking water, then residents on the Monterey Peninsula could save significant amounts of water each year. In doing so, they would lessen their impact on the Carmel River watershed and reduce their need for seawater desalination. Rio learned that greywater generated in homes could be acidic. As we learned from news stories out of Flint, Michigan last year, acidic water corrodes pipes. It also damages o-rings and washers on toilets creating leaks. Rio set out to measure pH of greywater in her home and at two local restaurants. She found that in most cases, greywater was not acidic (pH>7). She concluded that it would be okay for toilets. Rio next presented a mathematical model to highlight the value of greywater. She assumed all households on the Monterey Peninsula would install a recycling system (for example, AQUS greywater system) and that all toilets would be flushed only with greywater from showers (third largest water use). She discovered that the community could save 1,800 acre feet of water (586 million gallons), which is 12% of the Peninsula’s annual water budget. While this is less than 6,900 acre feet of water needed from a proposed ocean desalination plant, Rio does show how in-home greywater recycling can reduce our water demand. In the future, greywater reuse leaves open the possibility of considering less costly alternatives to augment water supply such as purifying more wastewater and storm water instead of taking even more water to desalinate from the sea. NOTE: Indoor grey water systems are already in use in parts of California. In fact, all new buildings on Stanford’s campus have greywater plumbing for toilets. However, in Monterey County greywater is approved only for outdoor irrigation, not indoor reuse – for now. The combination of fish farming and crop production is a very forward-thinking approach to a future with limited water. Instead of choosing between fish and farms, imagine a world where we could have both. 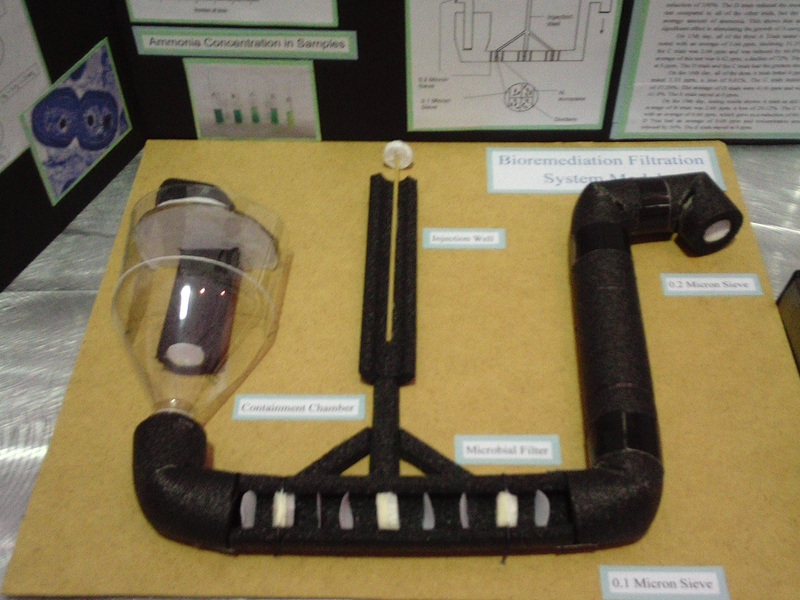 For her science fair project, Mia built her own aquaponic system. She wanted to compare growth rates of food crops in soil to growth in aquaponics. Using PVC pipe, she drilled holes to plant lettuce, chives, and broccoli. She attached a pump to recirculate water from an aquarium containing nine fish through the pipe and back. In aquaponics, fish provide the nitrogen for plant growth so the need for fertilizer is eliminated. Because fish use the water too, toxic pesticides cannot be used. To limit pathogens and insects, aquaponic farms are often housed indoors. Mia wanted to know whether plants grown with aquaponics were bigger than those potted in soil. Her results show both systems produced similar results. However, aquaponics promoted slightly better overall growth. Mia’s work suggests that aquaponic farming could make fertilizers and pesticides a thing of the past. Her vision of a new age of indoor farming saves water, money, and benefits the environment while at the same time, produces food. 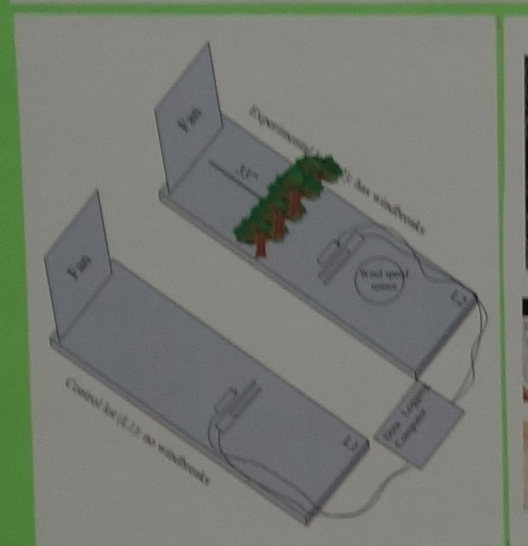 Mia recommends that her system be compared to hydroponic systems next. In terms of economics, hydroponics initially costs a lot less. However, fish are food too. Growing both fish and crops with the same water could pay off in big ways for future food production. NOTE: The judges were inspired by glimpses of future farming ideas proposed for Monterey County that use orders of magnitude less water than traditional methods. It should be noted that entrepreneurs are already investing in hydroponic farms. In fact, Kimbal Musk (brother of Tesla founder) recently unveiled a high-intensity farm system housed in shipping containers in New York City. His company, Square Roots, claims to be creating the next generation of real food entrepreneurs for urban settings. You can check it out by going to: Squareroots.com. Dilan Patel and Katherine Dean (Photo: C. Reeb). 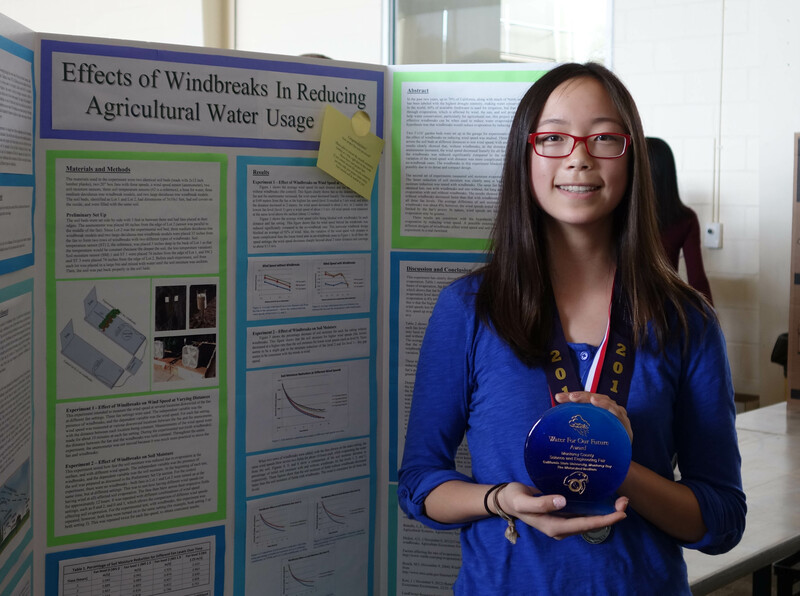 This year’s Monterey County Science and Engineering Fair fell on a partly cloudy weekend in early March sandwiched between two El Nino storms. But that did not stop nearly 500 middle and high school students from gathering in the University Ballroom at California State University, Monterey Bay. Nor did it stop a team of judges from searching for this year’s winner of the “Water For Our Future” award. This special water award is co-sponsored by Stanford’s Hopkins Marine Station and CSUMB’s Watershed Institute. It recognizes projects that find ways to solve a water shortage at home, at work (school), or on the farm. Of 330 posters presented at the fair, 29 were identified as “water-related.” Of these, 11 were short-listed for our award. Among these projects were topics ranging from seawater desalination to aquaponics; from the benefits of worms to improve soil porosity to assist groundwater recharge to the use of drones to measure crop cover, which can reduce the need for irrigation. After reading through hundreds of titles and dozens of posters, one project emerged as the unanimous winner. This year’s Water For Our Futureaward goes to 8th graders Katherine Dean and Dilan Patel from Carmel Middle School. The title of their project: GOT DESAL?Katherine and Dilan were motivated to study seawater desalination out of concern for water shortages impacting not only California, but throughout much of the world. Because 97% of earth’s water is contained in salty seas, why not make use of seawater to meet future water demands? However, removing salt with modern methods such as reverse osmosis is costly. These students wondered if there were other alternatives. During their literature research, Katherine and Dilan discovered how ancient civilizations desalinated seawater with virtually no cost at all. For example, ancient Greek sailors would place buckets of seawater beneath sails. As the sun heated the buckets, fresh water would evaporate and condense as droplets on the cooler sails. In time, the sails would drip with fresh water, which was collected for sailors to drink. By harnessing the power of the sun, ancient seafarers obtained low-cost fresh water from the ocean. Our students searched online for information to build a solar desalination device (check out ScienceBuddies.org). They began with a light-colored plastic container as their seawater bucket (or reservoir). Because they knew heat energy from the sun was best absorbed by darker colors, they wondered if the solar device could be made to produce more water if they darkened the color of the reservoir. They decided to test this idea by placing white, black, blue, and brown papers beneath the plastic reservoir. Katherine and Dilan repeated their experiment three times for each color. I have taken the liberty to reproduce their results, with error bars, on the graph below. The error bars outline the variability across all three trials. Each bar represents two standard deviations of the variance, also known as the 95% confidence interval, which scientists use to support or reject hypotheses. Because the black paper consistently produced the same amount of fresh water for all three trials, there is no variability in that data for the error bars to show. The graph clearly shows that the black paper consistently produced the most water. The brown reservoir appears to be second best. However, look closely at the error bars. You will notice that the brown error bars overlap with those of both white and blue. This overlap tells us that there is too much variation in the data to conclusively say brown is better at producing water than either blue or white. In fact, this experiment would need many more trials showing the same trend before we could statistically support that statement in a scientific study. Meanwhile, none of the error bars overlapped with the black bars. Therefore, we can say that the results support the hypothesis that the black paper beneath the reservoir produces significantly more water than the other colors. This is what Katherine and Dilan concluded. Congratulations to Dilan and Katherine, their parents and teachers, and the many other students who undertook water projects at the science fair this year! The science of water is a huge, multidisciplinary field encompasses fields of study for land, sea, and atmosphere. This year, I was happy to welcome four graduate students from CSUMB’s Watershed Institute and Stanford’s Hopkins Marine Station to help judge a wide variety of projects for this award. These Master’s and Ph.D. candidates volunteered their time and expertise in hydrology and ocean science. They sorted through hundreds of titles, contemplated a broad range of hypotheses, interviewed dozens of students, and thoughtfully discussed the merits of each project before deciding on a winner. This year for the first time, I was able to mentor these graduate student while they took on the role of mentoring our youngest scientists. On that weekend, for the first time in a long time, the high Sierras were covered in snow. The hills of Monterey County had turned a lush shade of green. Even the Carmel River was flowing with a rush down the watershed to the sea, all thanks to an ocean-driven El Nino event causing atmospheric rivers of rain to rumble ashore and rejuvenate the land. And for the first time that I can recall, three generations of scientists assembled together under one roof to discuss the future of water in California while sharing their perspectives of both land and sea. Kaitlyn Chow, The Watershed Institute, CSUMB. Crystal Ng, Hopkins Marine Station, Stanford University. Alan Kleven, The Watershed Institute, CSUMB. Natalie Low, Hopkins Marine Station, Stanford University. As California enters a forth year of unrelenting drought, more students in Monterey County seem to be thinking about the importance of water in their future. This was evident at the Monterey County Science and Engineering Fair held last weekend on the campus of California State University – Monterey Bay. Of approximately 350 projects, 63 were water-related. A three-judge team considered 9 finalists before choosing the winner of this year’s “Water For Our Future” award. Megan understood how wind and rising temperatures could increase evaporation. She had read how windbreaks could help lower water loss in fields. Thus, she decided to design an experiment to quantify how effective windbreaks were at conserving soil moisture, which could help reduce the use of agricultural water. Design of Model Farm Fields. First, she constructed two model farm fields – one with a windbreak (test plot), the other without (control). Soils for each model were equally moistened in a single tub then spread out across the two fields. Small shrubs were used to mimic “deciduous trees,” typical of windbreaks while household fans were used to generate winds. After preliminary runs to assess air flow and wind velocity in her experimental design, she was ready to put her question to the test: Would fields with windbreaks maintain higher soil moisture levels than those without? Fans blew across the “fields” at three different speeds (low, medium, high) for 10 hours. Temperatures and soil moistures were monitored and recorded. Experiments were then repeated. What the judges liked most about this project was the simple, yet eloquent use of logic in the experimenter’s design and execution, as well as the clear conclusions that followed. Megan showed how fields with windbreaks did indeed maintain higher soil moisture. 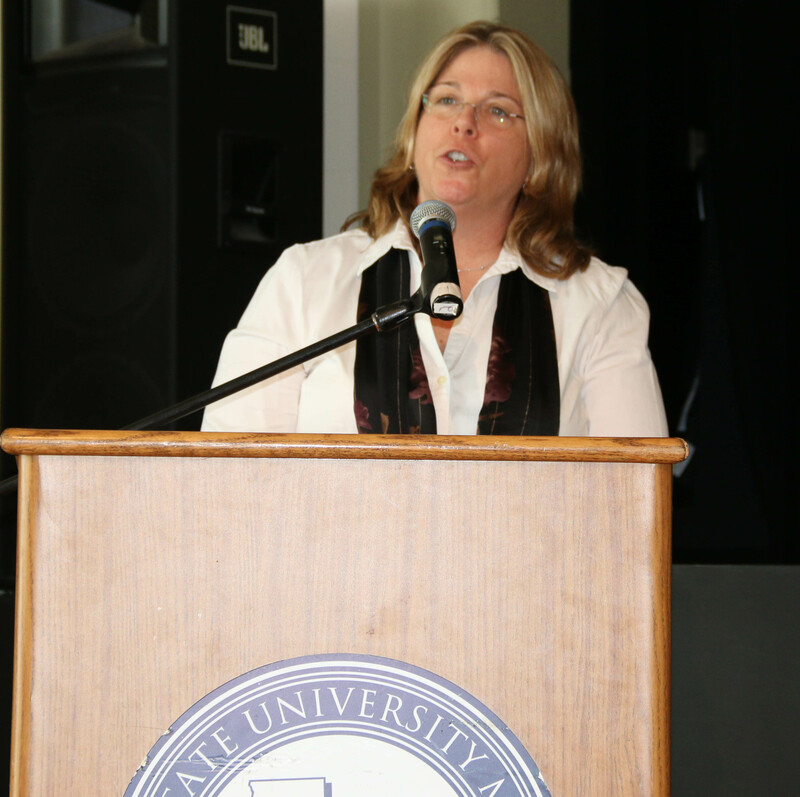 Her study concluded that windbreaks reduced water loss by an average of 4%. Graphs show how wind speed varied with and without windbreaks. Interestingly, faster fan settings on fields with windbreaks (Figure 2) showed a sudden drop in velocity 2 meters behind the windbreak. Can you think of reasons why? The speaker (Robert Glennon, University of Arizona) explained the importance of this fact in a paper he co-authored with others as follows: One acre-foot of water (about 326,000 gallons) used to grow alfalfa generates roughly $920. The same amount used to grow lettuce (in Arizona) generates $6000. But an acre-foot of water used by Intel to produce microprocessors for computers brings in $13 million. The arithmetic, he said, was intriguing. In other words, it is not just farmers who need water. We all do. But we also need farms to produce the food we eat. Hence, water solutions in the future must include innovative ways to irrigate farms while leaving enough water behind for the many other uses that benefit our State. Eighty percent of California’s water is used by agricultural. Better water management and conservation practices are needed for our future. Windbreaks can save farms water. Although trees (that consume water) are often used, I hope Megan’s project inspires creative ideas in landscaping that lower wind speeds, conserve soil moisture, and reduce the need of water for irrigation. 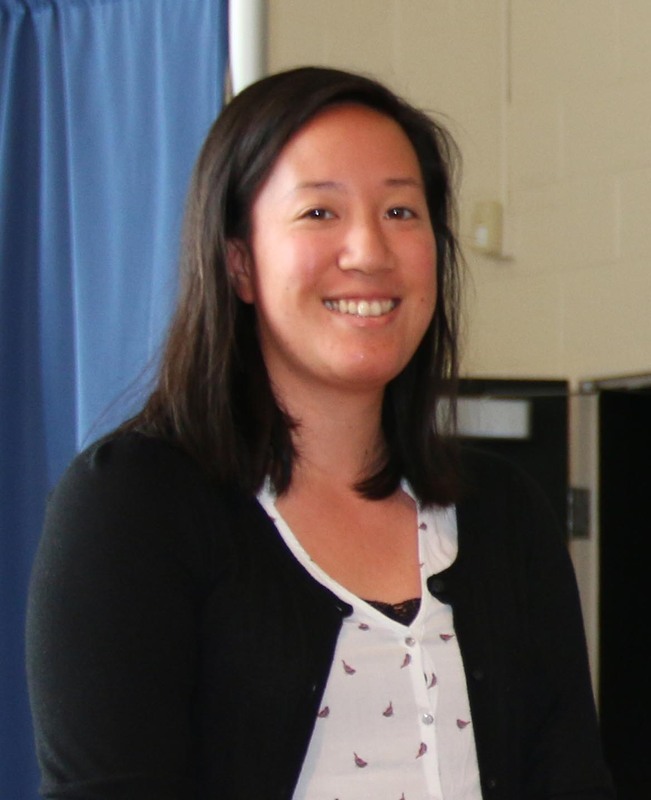 Again, congratulations to Megan Tang and York School for winning this year’s Water For Our Future award! 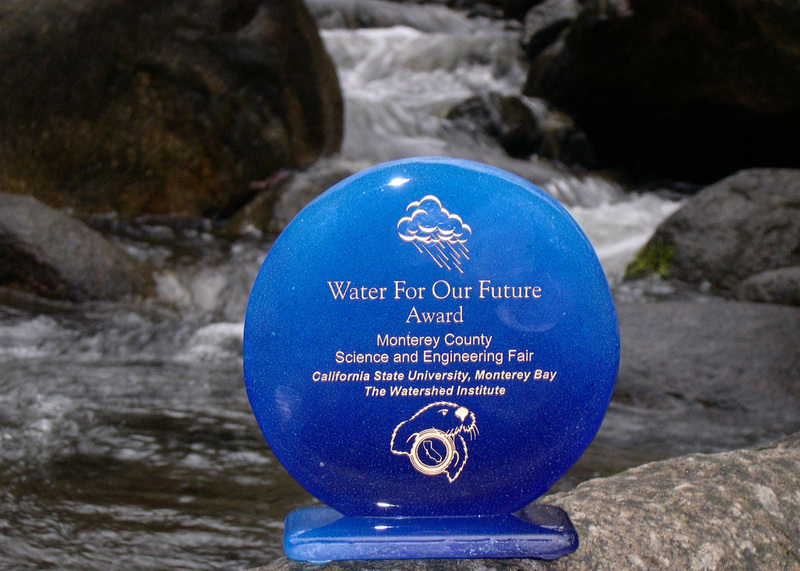 Over the last 4 years the Water For Our Future Award has been presented at the Monterey County Science and Engineering Fair, I have been impressed with the quality and complexity of our winning projects. From the effects of saltwater intrusion on plant growth to the documentation and measurement of contaminants in rivers and storm drains, these students have brought awareness to problems facing water supplies and aquatic environments in our community. This year, our winners took a step further. They designed a solution. Nitrosomonas europaea is a common bacterium found worldwide. This beneficial microbe plays an important role in the global nitrogen cycle. It is needed for the first step of a pathway that converts toxic ammonia into a form of nitrogen that can be used by plants. Nitrosomonas has been used in biological filters, like those found in fish aquariums, to maintain water quality. It has also become very important in wastewater recycling facilities, such as the one in Marina, CA, where wastewater is turned it into “Safe Water” for irrigation (this is the water flowing through purple pipes in farm fields). As these students write, Nitrosomonas europaea can be used for the “bioremediation” of water sources contaminated with nitrogen-containing compounds like ammonia. One such water source is the Salinas River and its aquifer. They cite a UC Davis study suggesting that 90% of the ammonia in this river can be traced to fertilizers. What Christopher and Rohan did was to show how addition of magnesium sulfate (also found in Epson Salts) enabled Nitrosomonas to increase the rate of ammonia oxidation. Next, they cleverly designed a filtration system containing this microbe (see photo at right) that successfully removed ammonia from contaminated water. They then suggested that a scaled-up version of this filter might one day clean up excess ammonia in the Salinas River. Science fair judges love it when students consider the bigger picture. As a result, this junior-level project also won first prize in Microbiology. Microbial filter designed by Bhushun and How. Photo: C. Reeb. Solutions to some of humankind’s biggest dilemmas can begin early in the minds of young people. With most of California affected by drought, this year’s fair brought a number of water-related projects to the judges for consideration, each offering solutions for the future. Varying the amounts of fertilizer to maintain plant growth, but with less water. Certainly, water solutions are on the minds of young people in Monterey County. So, if you ever wonder how scientists come up with eloquent solutions to modern problems, think about visiting the Monterey County Science and Engineering Fair next year and see where it all begins. You will walk away knowing our future is in good hands. This year’s winner is ninth grade student, McKenna Gibson, of York School in Monterey, California. The title of her project: Copper Concentration in Stormwater Runoff South of Carmel. McKenna’s project measured copper in two creeks flowing into the ocean from the Carmel Highlands. The locations of these creeks are shown on the map in Figure 1. McDougall Creek is a small stream running through the middle of the Highlands community. Mal Paso Creek begins in the mountains and flows along the community’s southern edge. This watershed has few roads and homes compared to McDougall Creek. Elevated levels of copper are toxic. The primary sources of copper in urbanized areas come from rain gutters and roofing on our homes, as well as brake pads on our cars. During storms, copper is washed into rivers, streams, and storm drains where it eventually makes it’s way offshore. Chronic exposure to copper is not only harmful to marine fish, but excess copper is now being linked to toxic algal blooms too, as suggested by another contending project for this year’s award. Stormwater monitoring has been ongoing for nearly a decade. Each year, citizen scientists volunteer with the Monterey Bay National Marine Sanctuary to collect water samples during the first heavy rains (“First Flush”). Typically, these storms contain the greatest amount of pollutants. McKenna analyzed copper levels in McDougall and Mal Paso Creeks and compared those results to sites in the First Flush database. Her conclusion provided a humbling reality for our community: urban development is linked to higher copper levels in storm runoff. Data from “First Flush” monitoring is publically available online. McKenna cites a study from 2011 which found half of all monitored sites around Monterey Bay exceeded copper limits, including four of five sites monitored in Carmel. 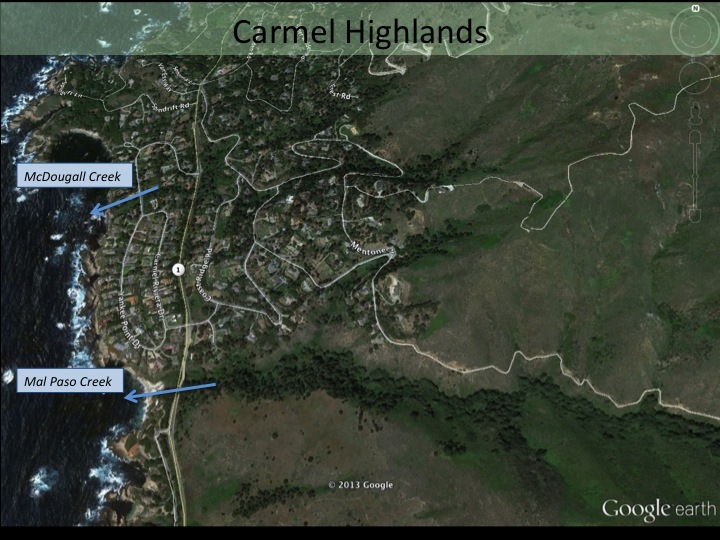 Her study on two new sites south of Carmel gives us a glimpse of what copper runoff in Carmel used to be and what Carmel Highlands could become as the area continues to grow. The study’s Discussion section explains that the easiest way to control copper is to stop it at the source; that is, to simply make car brakes, gutters, and roofing materials without it. What we, as judges, saw in McKenna’s well-referenced, statistically analyzed study was sound evidence for why stormwater cleanup is so important. We were impressed. Once again, Monterey County’s young scientists are exploring ways that can solve a water shortage. For our future, I continue to be very hopeful. This year’s award went to 8th graders Helena Guenther (All Saints Episcopal Day School) and Kaelene Jensen (The Monterey International School) for their outstanding projects on pollution and water quality in the Carmel and Salinas River watersheds. Sponsored by CSUMB’s Watershed Institute and co-director Dr. Doug Smith, the award was created by Dr. Carol Reeb at Stanford’s Hopkins Marine Station. It seeks to encourage young people to think now about future ways to solve a water shortage at home, at school (work), or on the farm. As many of us know, the Monterey Peninsula is not the only place facing a looming water problem. Helena Guenther recognized this by writing, “…each year, 1.5 million children die worldwide from a lack of clean water.” With that, she set out to collect water samples from two sites along the Carmel River, using tap water as a control. She measured bacterial levels for each sample, then compared the effectiveness of various water purification treatments to remove the bacteria. Afterwards, each treatment was ranked by effectiveness and cost. While iodine tablets completely removed bacteria, solar disinfection was found to be cheaper but, in this study, could not remove all the bacteria, which is important. Hiking filters, which I rely on in the backcountry, were expensive and not so effective. As a former Peace Corps Volunteer serving in Africa many years ago, I was struck by the motivation for this science fair project; that clean, potable water should not be taken for granted. As Helena concludes, water scarcity is threatening the environment and economic growth around the world, even in Monterey County. This young scientist puts our own water issues in perspective. 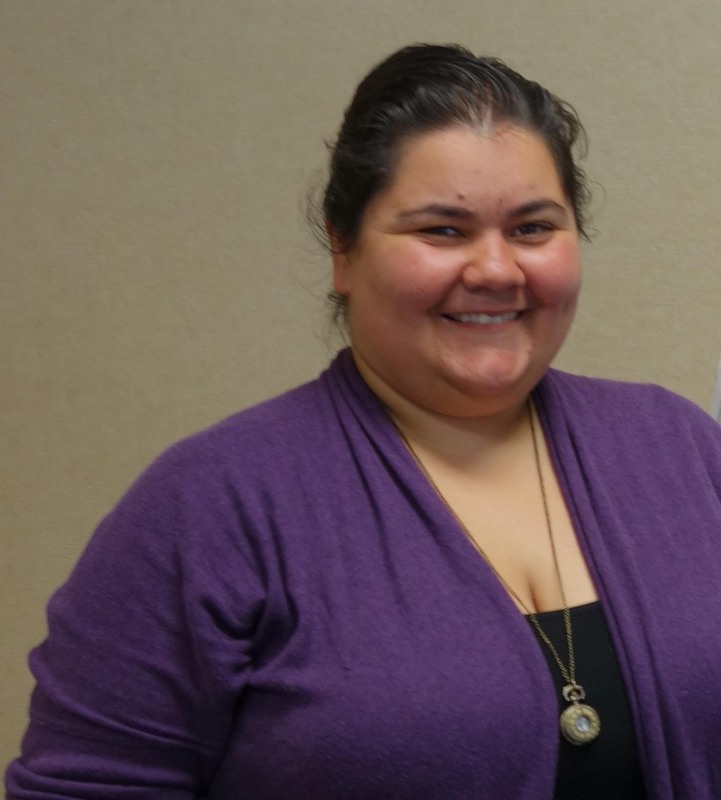 The title of her project: Water for Life: Developing Water Purification Treatments for Use in Developing Countries. Our co-winner, Kaelene Jensen turned her attention to the Salinas River. She writes, “Have you ever wondered about water pollution as you see the Salinas River flowing out towards the bay?” In an ambitious sampling of 7 sites, before and after rainstorms, from King City to the Highway 1 Bridge, Kaelene documents the increasing accumulation of nitrates as the river flows to the sea. As a control, she tested water from the Arroyo Seco River collected from an area with little agriculture. As expected, this site showed low nitrate levels. As a marine biologist reading this study, I was impressed by the awareness and courage this young scientist had to take on a water topic so important, relevant, and hotly debated. Kaelene writes in her conclusion, “…high nitrates not only impact ocean health by providing nutrients for outbreaks of Red Tide, but they impact human health as well.” She is absolutely correct. Red Tide blooms sometimes contain algae species that produce toxins harmful to marine mammals, fish, and people. Kaelene’s work reminds us that what we do on land has consequences downstream in the sea. The title of her project: How Do Nitrate Levels Along the Salinas River Compare to Non-farm Tributaries? After reviewing all the projects at this year’s fair, Doug and I were thrilled to see so many students take on the topic of water. We are proud of these young scientists, their teachers, and the sound scientific methods found in their presentations. From fog catchers to salinity tolerance, to water quality and recycling, the students of Monterey County are preparing for the future. Are we?